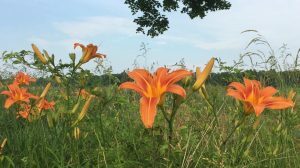 Orange day lilies, under a milky-blue sky and a few leafy branches of my favorite tree, welcome summer. I am Dale Katherine Ireland, and I’d like to welcome to my Toward Critical Access Theory blog. I am a doctoral student at the Graduate Center, CUNY. My interests include disability studies, composition and rhetoric studies, eighteenth- and nineteenth-century British literature, and digital humanities. I’ll use this blog to develop, test, abandon, and discuss ideas.